The Physio Control Lifepak 20e is clinically advanced and packed with power. The Lifepak 20e defibrillator and monitor is highly intuitive for first responders and combines AED and manual capabilities so the ACLS-trained clinicians can quickly and easily deliver advanced therapeutic care. The CodeManagement Module adds waveform capnography and wireless connectivity to enhance your hospital’s ability to effectively manage resuscitations from preparedness through review. The CodeManagement Module adds additional capabilities to the 20e to help aid how your facility manages codes. 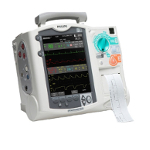 Designed for crash cart use, the Physio-Control Lifepak 20e Defibrillator meeds all your defibrillator/monitor needs in a compact and affordable package. It is simple yet powerful with special features like capnography, CPR metronome, and the ability to remotely send data to CODE-STAT data review. Battery Charge Time: <4 hours when device is powered off and AC power is applied. Run Time: A new fully-charged internal backup battery will provide between 110-210 minutes of run time depending on how it’s being used. thepatient via QUIK-COMBO paddles or Lead II ECG for potentially shockable rhythms. The device is capable of transferring data records by IrDA. The device captures and stores patient data, events (including waveforms and annotations) and continuous ECG waveform records in internal memory. With the door closed, the 20e can function as an Automated External Defibrillator (AED) for your BLS teams to begin early defibrillation before the code team arrives. It features a standard and clear user interface that is recognizable if you have ever used with Lifepak 12 or Lifepak 15 defibrillator. It has a larger code clock that provides better visibility throughout the room, and standardized devices to use for time management and documentation. Ensuring stability and efficiency during patient transport with its compact design and ergonomic footprint, this defibrillation also can be set up to Auto-send patient and device data facilities quality improvements review and hospital-wide tracking when equipped with the optional CodeManagement Module. The 20e Defibrillator/Monitors also has Capnography aids ET tube placement and CPR effectiveness, as well as other advanced monitoring parameters including; ECG (3 or 5 wire), pacing, and pulse oximetry. An integrated metronome helps rescuers perform compressions at the AHA Guideline rate of 100/minute. The Lifepak 20e automatically performs a daily readiness self-check. Using LIFENET Asset status, you can wirelessly monitor the device data including battery charger, updates, and self-tests, and even allows your Biomed team to complete upgrades that would have previously required a service call. The 20e runs on a long-lasting lithium-ion internal battery and can be connected to an AC power source.